Staying up all night and watching the stars was meant to be an entertaining evening with your friends. Looking up at the perfectly clear night, everyone was delighted to see a shooting star streak across the sky. Delight quickly turned to horror as the “star” stopped in mid-flight and then landed in a nearby cornfield. 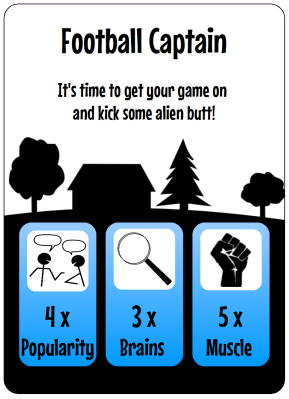 Investigating, you and your friends discover that aliens have landed! Time to show your small town how great the high school seniors are and save humanity! But do it fast, as Prom is next weekend. Pluto Attacks!, designed by Troy T. Pichelman and published via the Game Crafter, is comprised of 42 Pluto Attacks cards, 6 Hero cards, 6 Player tokens, and 15 standard six-sided dice. 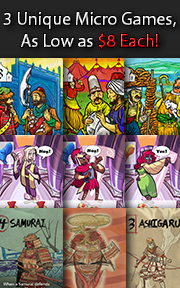 There is very minimal artwork to be had in the game, but the layout of each card maximizes the card space to present information in a way that looks organized and is easy to absorb at just a glance. The entire game fits in a small card box and is very portable. To set up the game, first shuffle the Pluto Attacks cards and place the deck in the middle of the playing area, face-down. Draw 1 card per player, placing each card in a row, face-up. Second, randomly deal or allow each player to select 1 Hero card. The Hero card is placed in front of the player, face-up. Then hand each player 1 Player token. Color doesn’t matter. Place the Player token on the Hero card. The remaining Hero cards and Player tokens are returned to the game box. Third, place the dice in the middle of the playing area and within easy reach of all the players. This is the dice pool. That’s it for game set up. Determine who the first player will be and save Earth! Players will be taking on the roles of unlikely small town heroes. Each Hero card is unique and provides a specific number of dice for the 3 Skills used in the game. The Skills are Popularity, Brains, and Muscle. Or, if you prefer, the ability to communicate, figure things out, and use brute force to get things done. Each Hero is a mix of these three Skills, with obvious strengths and weaknesses in certain areas. From a player’s perspective, the Skills and the numbers underneath them represent the number of dice that the player can use on their turn. Note that the Skill die number value is the Hero’s default aptitude. The player can discard cards to get more dice, albeit only temporarily. Players also work together and can cooperatively use their Skills to battle the alien invaders. This means that one Hero’s weakness can be overcome by another Hero’s strength. Each Pluto Attacks card represents a location, thing, or person of interest. The players will cooperatively attempt to secure these cards, ensuring the alien invaders no longer have any influence over them. The longer the Pluto Attacks cards stay on the table, the greater the threat to Earth. The threat level is measured by the Alien Influence value on each Pluto Attacks card. If the total Alien Influence of all the Pluto Attacks cards not yet secured by the players equals a specific number or higher, Earth is doomed. To avoid a total alien takeover, players move their Player token to the Pluto Attacks card they want to help secure. Then the player rolls a number of dice equal to their Hero’s Skill dice value that matches the Pluto Attacks card’s Skill. The dice values on the Pluto Attacks card represent the number of dice that must have the number value listed matched or exceeded. 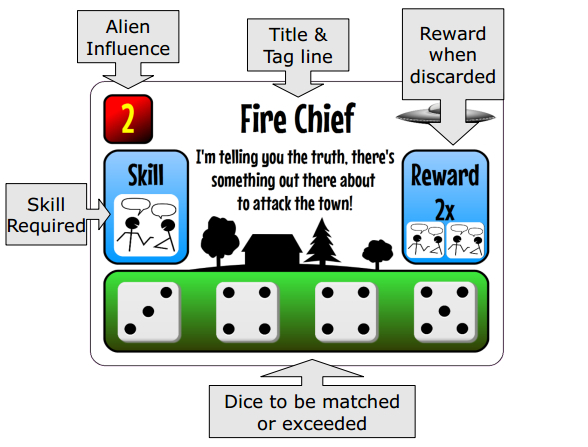 In the case of the “Fire Chief” Pluto Attacks card, a player could secure the card if they rolled the exact numbers listed (3, 4, 4, and 5), higher (4, 5, 5, and 6), or any combination of the two (4, 4, 5, and 6). The Reward value provides the player who secures the card with bonus dice or an ability if the Pluto Attacks card is discarded later in the game. Both the Hero and Pluto Attacks cards use the same symbols. What little text there is on the cards is there to support the game’s thematic element and forward the narrative during game play. The only requirement to play this game is pattern matching, simple math, and remembering what the handful of symbols represent and allow within the game. Pluto Attacks! is a cooperative game, meaning all the players are working towards a common goal and need to assist each other to achieve it. This is not a game where one player wins. Everyone will succeed or everyone will fail. Table talk is encouraged between players and suggestions on tactics or strategies should be discussed openly. Avoid allowing one player to lead the group or make all the decisions. Each player has a role to play. Pluto Attacks! is played in turns, with players taking turns in clockwise order or mixing the turn sequence until the game is lost or won. A player’s turn is summarized here. The first thing a player does on their turn is draw and reveal a new Pluto Attacks card. This card is placed face-up next to the other Pluto Attacks cards not yet secured by the players. I suggest you put them in a row or in columns and rows. The amount of playing space will determine how the cards are organized. 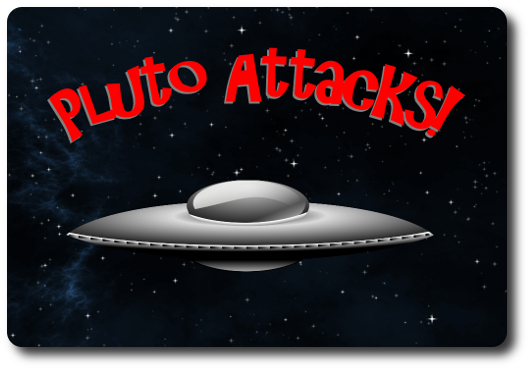 The main concern is to ensure that all players can see the Pluto Attacks cards and can easily determine the current Alien Influence total by adding all the Alien Influence values found on the Pluto Attacks cards not yet secured. Now the player decides which Pluto Attacks card they want to help secure. When the game first begins, none of the Pluto Attacks card will have dice or Player tokens on them. As the game progresses, players will be placing dice on multiple Pluto Attacks cards until they are secured. A player may choose to go to any Pluto Attacks card that has not yet been secured, regardless of how many dice or Player tokens it might have on it. Once the player decides which Pluto Attacks card they want to help secure, they move their Player token and place it on the Pluto Attacks card. The Player token helps the players keep track of who is working on what, but the distance between each Pluto Attacks card is not relevant to the game when moving. IMPORTANT! : A Pluto Attacks card must have at least 1 Player token on it at all times or any dice that are currently assigned to it are returned to the dice pool! Thematically speaking, the Heroes are no longer working on securing the card and have walked away, allowing the aliens to regain influence and control. Then the player takes the a number of dice equal to the Hero’s Skill dice value that matches the Pluto Attacks card’s required Skill and rolls them. The player also gets a few bonuses. The total number of dice rolled is determined by adding the following numbers. That might be a bit difficult to grasp at first, so let me give you an example of an attempt to secure the “Fire Chief” Pluto Attacks card. Using the above example, the player would now rolls the 3 dice and attempt to match or exceed any open dice values on the Pluto Attacks cards. Any dice that do remain on the card, cover the dice value they are assigned to. Any dice that do not, return to the dice pool. Note that there are a few Pluto Attacks cards that provide a Reward that allows players to re-roll the dice they are rolling on their turn. Any dice that have been rolled and assigned a value on the Pluto Attacks card are “locked”. Players cannot shuffle around the dice values previously rolled. It’s also worth noting that the number of dice available to the players to roll is limited by the total number of dice in the pool. When dice are locked on a Pluto Attacks card, they will not return to the dice pool until all the Player tokens are removed from that Pluto Attacks card or the Pluto Attacks card is secured. When a player chooses to use a previously secured Pluto Attacks card to assist in securing the current objective, they must discard it. Only those Pluto Attacks cards that have the same Skill for a Reward as what is shown as the Required Skill are permissible. For example, a player could discard a previously secured Pluto Attacks card if it provides a “Popularity” Skill Reward if they were located on the “Fire Chief” Pluto Attacks card. The only previously secured Pluto Attacks cards that can always be used are the ones with the “Re-Roll” Skill Reward. If the Pluto Attacks card now has the number of dice required that have values meeting or exceeding those listed, the card is secured. The card is only taken by the player who placed the last required dice to secure the Pluto Attacks card, regardless of how many other players helped secure it. Secured Pluto Attacks cards are placed in front of the player who claims it. All Player tokens located on the secured Pluto Attacks card are returned to their owners. All dice on the secured Pluto Attacks card return to the dice pool. If the Pluto Attacks card was not secured, the dice remain for as long as at least 1 Player token is located on the Pluto Attacks card. If the Pluto Attacks cards secured by the players total 4 or more “Victory” Rewards, the players have won the game! If the total number of Alien Influence for all Pluto Attacks cards not yet secured equals 40 or more, the players have lost the town to the alien invasion. If the Pluto Attacks draw deck is ever exhausted, the players have run out of time and the aliens win. If none of the above victory or defeat conditions exist, game play continues with the next player taking their turn starting with step 1 noted above. If the players are finding the default difficulty of the game to be too easy or too difficult, the game can easily be adjusted to accommodate the players. Regardless of the number of “Victory” Rewards necessary for the players to win, the aliens will always win if the total number of Alien Influence is 40 or more, or the Pluto Attacks draw deck is exhausted. The game suggests that Pluto Attacks! can be played with only 1 player. This is absolutely true. Set the difficulty low and play the game as you would normally with 2 or more players. The victory and defeat conditions are still the same. Going solo is very difficult and the player will be using their previously secured Pluto Attacks cards a great deal. 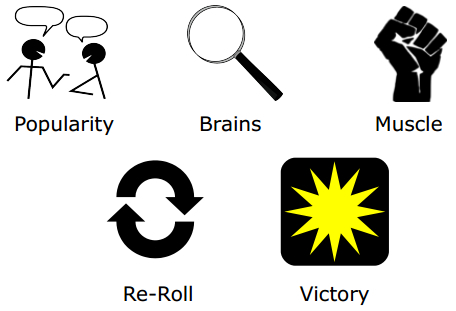 Each “turn” is defined as every interval between dice rolls, so make those dice rolls count! Some of our Child Geeks didn’t like that they were expected to play as a team, but couldn’t share cards they secured. We attempted to appease them by allowing the players to share cards as often as they liked, but at the cost of sacrificing 1 die. This was meant to thematically represent the time spent to grab whatever bonus the card provided and then use it during their turn. Overall, it worked pretty well, but I think it unbalanced the game a bit, making it easier to win. Give it a try and see if it works for your team of alien combatants. To learn more about Pluto Attacks!, visit the game’s web page on the Game Crafter. The Child Geeks very much enjoyed themselves while playing this game. A few of them took the game play to the next level by acting as their hero. Game play wise, the Child Geeks had no problem understanding what was required of them as a group to win the game. They did not always agree on where to focus their attention, however, and a few games were lost due to the Child Geeks not working together. According to one Child Geek, “You need to remember that there are only so many dice in the game and it’s easier to collect cards if you work together.” Very true, but one aspect of the game the Child Geeks failed to comment on was how a new Pluto Attacks card is drawn and put into play during each player’s turn. The game can and will snowball on you if you don’t manage the threat level by focusing on tackling and trimming cards. Another Child Geek said, “What I like best about this game is how you get to work together, but I don’t like that we can’t share cards.” This came up a number of times and we attempted a House Rule that allows card sharing. I personally don’t recommend it as it made the game way too simple. House Rule or no, the Child Geeks liked the game and gave Pluto Attacks! their full approval. The Parent Geeks also enjoyed the Pluto Attacks! and found it to be an engaging game of casual cooperative fun. 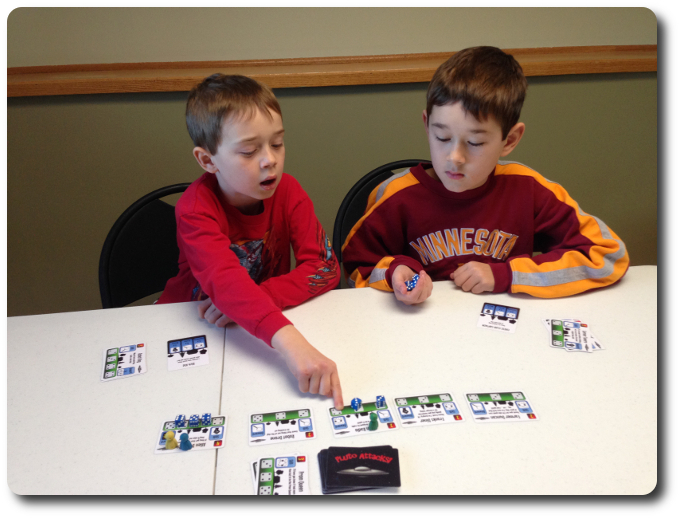 One Parent Geek said, “I like the rules and the game runs very smoothly. Each turn makes sense and the game just feels really well put together.” Another Parent Geek said, “I like how little there is to this game, but how much you have to think about. All cooperative games should be like this, focusing on the cooperative requirements on the players rather than putting the focus on the game bits.” Not really sure what was meant by that, but I interpreted the comment to suggest that the game play was always up and center without any distraction of game components getting in the way. When all the games were over, regardless if Earth was saved or not, the Parent Geeks voted to approve Pluto Attacks! The Gamer Geeks were mixed on this one. A number of them found Pluto Attacks! to be an excellent choice for a light filler, with the perfect balance of player engagement, game requirements, and difficulty. According to one of the Gamer Geek who enjoyed the game, “It’s a very tight little game. Simplistic in its approach without dumbing down the cooperative game play. I think it’s pretty good.” The Gamer Geeks who did not saw Pluto Attacks! to be an exercise in cooperative repetitiveness. According to one of the disgruntled Gamer Geeks, “All you do is roll dice. If you put enough focus on each card, you can easily win it. The only difficulty in this game is tolerating it and the random rolling of values.” Harsh criticism. Oddly enough, and in the game’s favor, none of the Gamer Geeks thought that Pluto Attacks! was a “bad game”. It’s just that some didn’t believe it was a “very good game”. Not enough to win over the gaming elitists, but more than enough for everyone to agree to disagree in a very civilized manner. Pluto Attacks! is a light cooperative game that fits easily in my pocket and can be played fairly quickly. Luck is ever-present, but can be easily mitigated by working together as a team. I think the default difficulty is way to easy and usually play with the “Hard” or “Elite” difficulty with experienced players. Not bragging, but Pluto Attacks! is not a difficult game by default. This negatively influenced some of our Gamer Geeks and left them with a poor first impression. Which is a shame, as Pluto Attacks! is a well-designed game, albeit a simple one. Still “simple” does not mean “worthless”. Pluto Attacks! has been a lot of fun to play and I absolutely love how small it is. Very compatible and I have yet to find anyone I couldn’t play it with. The biggest downside to this game is that after you play it once, you’ve seen the game in its entirety. The only surprises you’ll ever encounter are the random card draws, which were random to begin with, so no big change there. This had some of our players pondering if the game was one they would want to play again. It’s a tricky question to answer. One would think that elevating the difficulty would provide enough of a lure to bring players back, but that’s not always the case. I, and several other players, believe that Pluto Attacks! 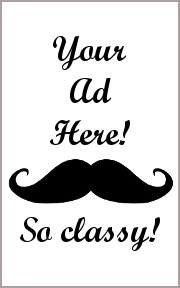 is a game best played when the optimal opportunity presents itself. The game is perfect for smaller groups who don’t have a lot of time, but want to play a game that challenges, entertains, and rewards good team play. Put another way, it’s a great game to bring out when you want to play against the game and not each other. Is Pluto Attacks! worth it? Oh, sure, but you’ll have to decide if the game is for you. It’s small enough to put in your back pocket, needs very little table space, can easily sit up to 6 individuals, and plays quick enough to be appropriate for just about any occasion where there is downtime. That’s not too bad, eh? If you agree, take a closer look at the game when time allows. Tagged Card Games, Child Geek Approved, Cooperative Games, Parent Geek Approved, Science Fiction Games, Solitaire Games. Bookmark the permalink.